It’s that time of year again: Time to bring out your lawn chairs, fire up the grill and munch on your favorite foods while you watch fireworks with friends and family. The best part about bringing an app to any cookout? You’re not in charge of the whole meal! Try out new flavors, like our Stuffed Pretzel Dippers with Cheesy Mustard Dip, or stick with a classic fan-favorite, like our Crescent Dogs, and get ready for some well-deserved compliments. Celebrate the Fourth of July in style with the tastiest appetizers out there. 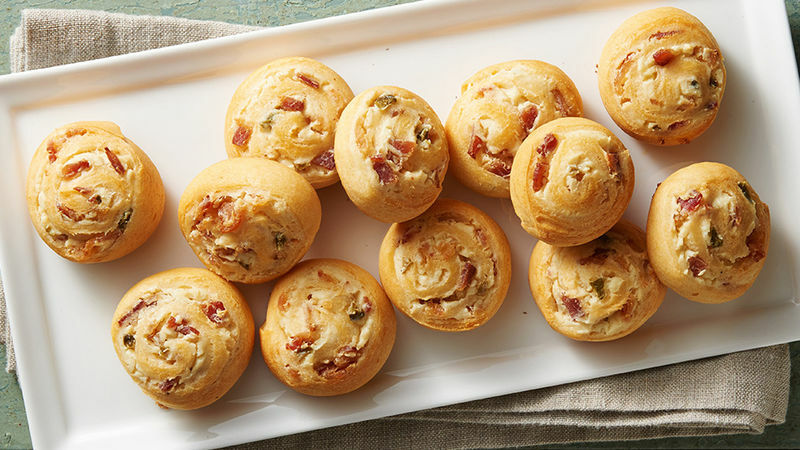 Need help picking the right appetizer to bring to a party? Here’s a few tips to keep in mind. When bringing any appetizer to a potluck, make sure to label your dish and call out any specific food allergens. This will save you time answering the “What is this? What’s in it?” questions. If you want to keep track of the dish or plate you brought, label the bottom of your plate with your name. This way, at the end of the party, you won’t have to guess which plate is yours. It’s also important to note that your appetizer will be served at room temperature. If you’re planning to make a dish that needs to stay cold, like a pasta salad or dip, bring along a few ice packs to keep your food cool. Finally, don’t leave your dirty dishes for the host! Bring along your own serving utensils and use disposable plates/containers if you don’t care to take your dishes home.